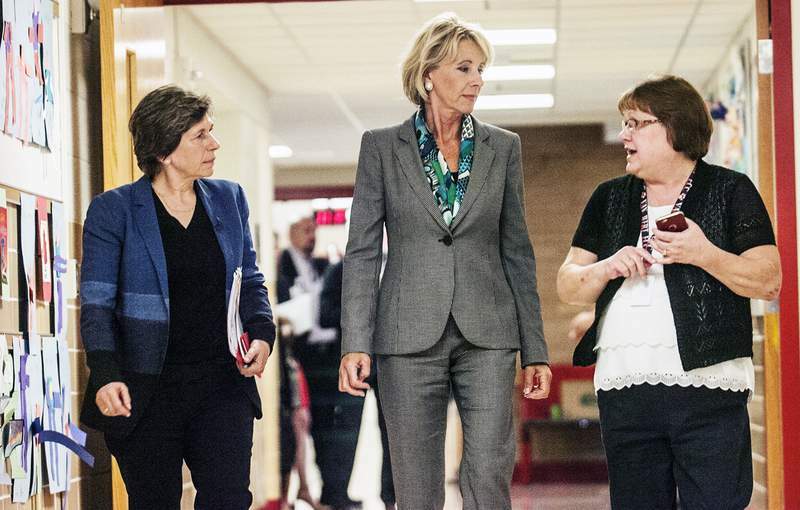 Cathie Rowand | The Journal Gazette Randi Weingarten, AFT president, left, and U.S. Education Secretary Betsy DeVos listen to Van Wert Early Childhood principal Lori Bittner as they tour the school April 20. Rachel Von | The Journal Gazette Jennifer McCormick, state superintendent of public instruction, speaks during the FWCS kick off at Memorial Coliseum in August. The Journal Gazette teamed up with HuffPost for an in-depth look at the School Choice Program, commonly referred to as vouchers. Stories by Journal Gazette reporters Niki Kelly, Ashley Sloboda and Rosa Salter Rodriguez and HuffPost reporter Rebecca Klein examine how the initial concept in Indiana expanded, the faith-based curriculum some schools use, whether vouchers are affecting the demographics of schools and where students with special educational needs attend, and the effect on home school enrollment. We also profile two Fort Wayne schools and share the stories of students. An interactive online map allows you to click on Allen County schools to discover their demographics and other information. Reyna Rodriguez is a poster child for Choice. 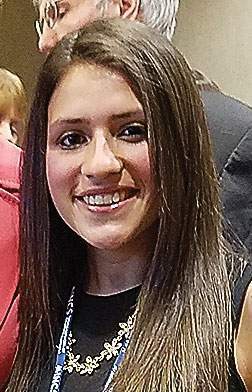 From a family of six children and two hard-working parents – a nurse and a firefighter – she used a tax-paid voucher to graduate from Bishop Luers High School last year in Fort Wayne. She is now a freshman at Indiana University. That speech garnered attention nationally, and in May Rodriguez was standing beside U.S. Education Secretary Betsy DeVos as a special guest at a conference in Indianapolis. That's because Indiana's voucher program – the largest in the nation after just six years – could be a guide for a national initiative. But not everyone is on board with using tax dollars to pay for religious education at a private school. GOP lawmakers implemented the program and have tweaked it little-by-little to expand its reach and possibly its entire premise. “The way it was rolled out was perceived to be more of a focus on our most at-risk students – to get them out of situations where public schools weren't performing,” said Indiana Superintendent of Public Instruction Jennifer McCormick. She is also a Republican, but this is one area on which she and her colleagues disagree. 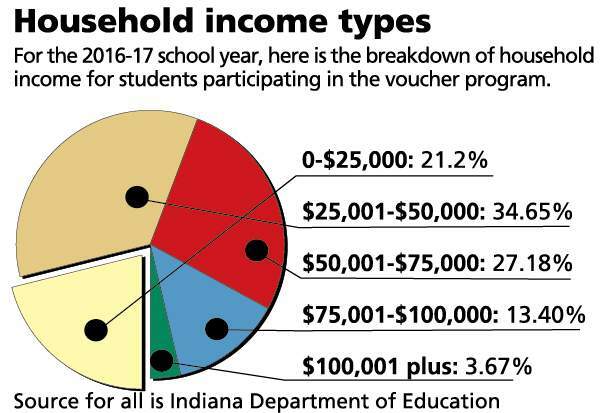 The latest report on Indiana's Choice program shows less than 1 percent of those with vouchers were from a failing public school. 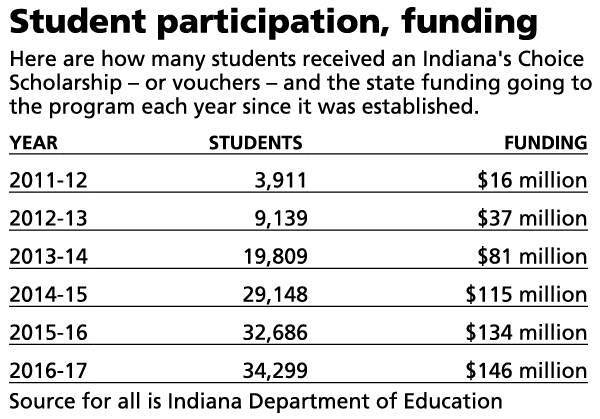 And most of those using vouchers have never attended an Indiana public school. There is no clear picture for what metrics should be used to gauge whether Indiana's experiment has been a success. Yet, the program has exploded – from 3,900 the first year to more than 34,000 students. 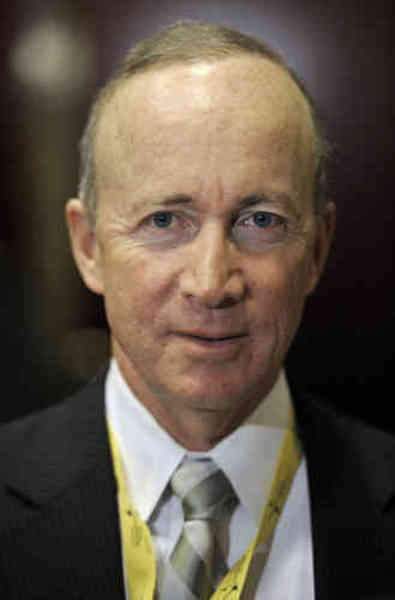 But Daniels – now in his fifth year as president of Purdue University – said the program was never solely about the academic performance of public schools. He clarified that's the big picture, but academic achievement and artistic growth are also important. Loesch's focus on God goes to the point that all but a handful of private schools accepting vouchers are faith-based. Some criticize state money going to religious programs, but the Indiana Supreme Court upheld the program early on as constitutional. Betsy Burdick, president of the Institute for Quality Education, said academic success is an obvious metric, but it's not the only one. The group has pushed heavily for choice in Indiana. “I don't think parents choose a school because they want their kids to fail academically. I think that's inherent in their choice.” But she added there are other measures, including class size, safety and values. 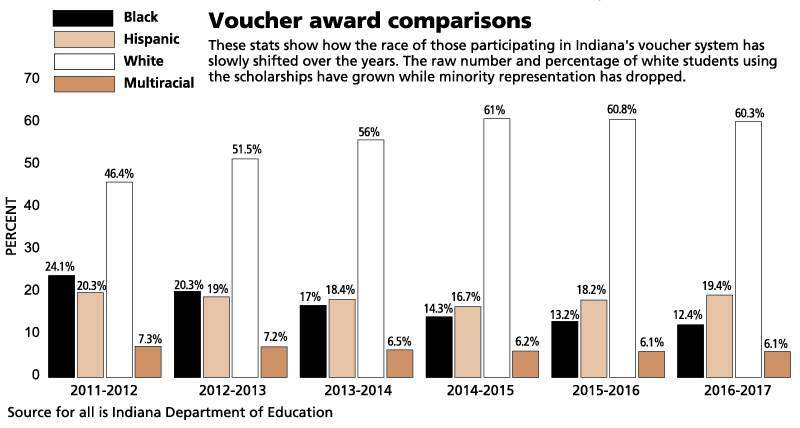 An initial study of data from Indiana's Choice program showed students using a voucher saw math achievement fall on average, though students who remained in private school for four years improved to match or outperform public school students in math and English. Not exactly a resounding victory for voucher supporters. “The piece used to sell it was all about academics and now they aren't interested in those comparisons,” said Teresa Meredith, president of the Indiana State Teachers Association. That allegation of segregation is showing up in the last few years of data as a growing number of those receiving vouchers are white. In the first year, 24 percent of voucher participants were black but that has fallen to 12 percent. Meanwhile the percentage of white students with vouchers has grown from 46 to 60. Hispanic involvement has grown in raw number but remained steady as a percentage of the total. Indianapolis GOP Rep. Robert Behning – a Choice stalwart – said vouchers are available to all financially eligible children regardless of race. And Robert Enlow – president and CEO of EdChoice – said vouchers serve more children of color than the state on average. He also said 2015-16 showed 68 percent of kids taking vouchers are on free and reduced lunch compared to 47 percent in public schools. “I think the thing that bothers me the most in the press is how this program is portrayed as taking significant funding away from the public school system when in reality it's about 1.5 percent of their total funding,” said Loesch. He said only 3 percent of students in the state are on vouchers. But the impact on public schools is at the heart of the debate as lawmakers provide a pot of money that has to be split among traditional public, charter and private voucher schools. McCormick noted that lawmakers have increased the dollars but there are also more school buildings vying for the cash. Both public and voucher schools must have their students take the state standardized test and those scores largely make up the A-F grades every school receives. The similarities stop there: all private schools in Indiana can choose to have unlicensed teachers; they can discriminate based on sexual orientation; they don't have a public budget; their board meetings aren't open to the public and they can deny admission to students because of grades, disruptive behavior and a students' special needs. On transparency, Meredith notes that voucher money has eased financial strains at churches who can now use donations to build chapels and facilities rather than support the school. Jenny Andorfer, director of admissions for Bishop Luers, said that is simply not true – pointing to the school's new media center as the latest improvement in an aging facility that was paid for by a fund drive. She said the vouchers don't cover the full cost of tuition and the church still provides financial assistance – especially to families just above the income cutoff. Rep. Martin Carbaugh, R-Fort Wayne, filed a bill last year to require voucher schools to submit a report showing how money received from each choice scholarship student was used by the school. Behning refused to hear the bill – noting the state provides millions in financial assistance for Hoosier kids to go to college. They can take those scholarships to public or private schools and no one is asking Notre Dame what it is doing with the money. Fort Wayne Community Schools has perhaps been hit the hardest by vouchers. An urban center known as the “City of Churches” – a vast network of faith-based schools was already in place. FWCS Superintendent Wendy Robinson is passionate when she says lawmakers have created a business of education. 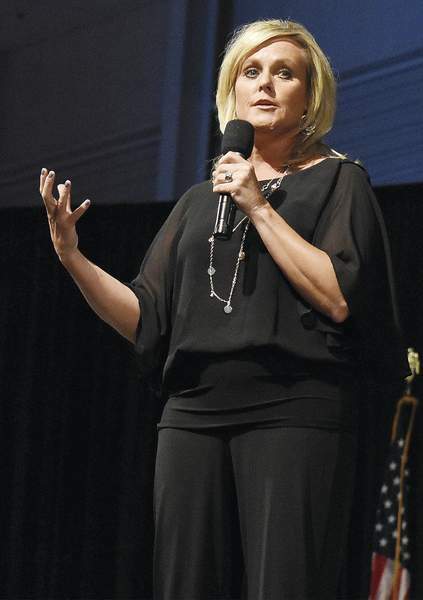 And she called out voucher schools for recruiting – not just for athletes but for transcripts. One local private school sent an acceptance gift basket with balloons and treats to a student at one of FWCS' magnet schools welcoming an eighth-grader to the new school. After a few, FWCS turned the baskets away. Andorfer and the diocese denied cherry-picking. And perhaps Daniels offers the best response to all the criticism. Robinson has seen almost 4,700 students leave FWCS on a voucher – and many are leaving A- and B-graded public schools. Dozens return every year too but there is still a net loss. Overall, the voucher retention rate during the school year is 95 percent. It drops to 80 percent from year-to-year as students are either not invited back, parents can't afford their share of the cost or they simply decide another option is better. “I don't want to come across as whining because it's the law of the state and, God help us, it could be the law of the land,” she said. “But let's not play games. Don't say this is the best thing because you're taking kids from failing schools. That's not what we see. That's because DeVos and President Donald Trump have touted a historic education choice proposal but have given no details. Burdick and Enlow – who have worked for years for choice – caution against some sort of national voucher, noting several states have their own system and it isn't clear how everything would work together. Folding a school choice tax credit into an under-construction federal tax reform bill is also an option. Daniels doesn't think there should be a national program at all – noting the power is in the hands of the states now to define their programs.